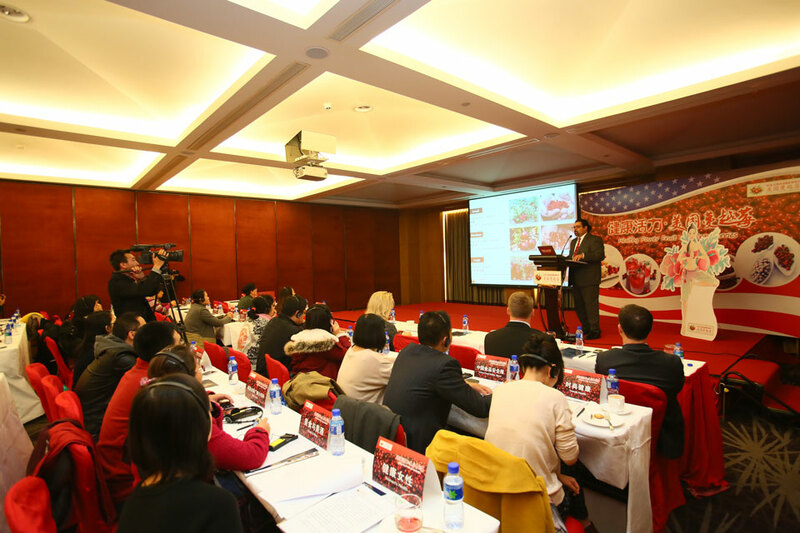 The U.S. Cranberries | Cranberry Marketing Committee (CMC) held a series of promotional activities in Beijing and Shanghai from November 11-15, 2013 aimed at expanding cranberry awareness and culinary applications in China. The first morning’s activities got underway at the Hilton Beijing Hotel with a combined media workshop and bakery seminar which attracted more than forty traders and twenty media. Ralph Bean, Director of ATO Beijing, delivered opening remarks, followed by an overview of the U.S. cranberry industry by Scott J. Soares, Executive Director of CMC. A presentation on the many health benefits of U.S. cranberries was delivered by Dr. Amy B. Howell. Dr. Howell, a Rutgers University research scientist with more than 20 years of experience studying cranberry health effects, was recently a part of an international study showing that the bioactive compounds found in cranberries are a rich source of phenolic bioactives with wide-reaching health benefits that cannot be replaced by other berries, dried fruits or juices. As part of their “cranberry experience,” workshop participants were invited to a unique lunch composed entirely of foods and beverages incorporating U.S. cranberry products. To further enhance their taste for U.S. cranberries, participants were also treated that afternoon to a demonstration by Michael D. Rosenblum, Executive Chef to the U.S. 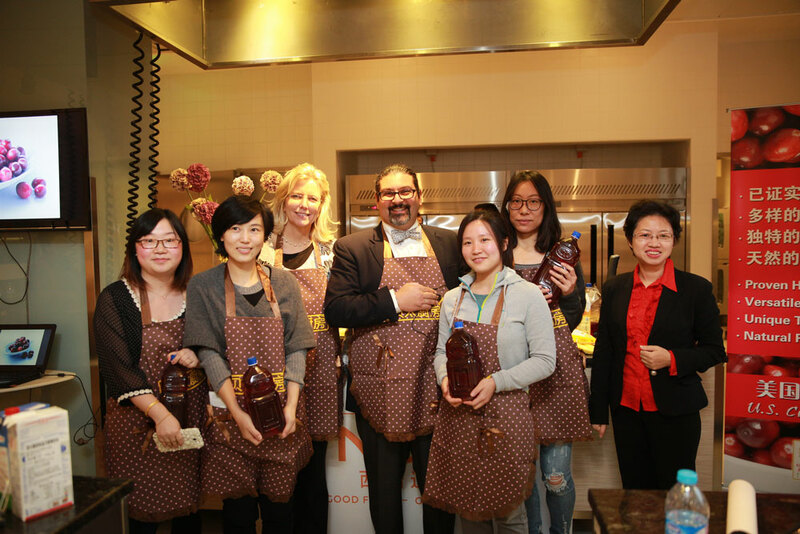 Ambassador to China, who unveiled five recipes especially created for U.S. Cranberries to showcase the fruit’s versatility. The chef demonstration was a visual and flavorful feast for the more than twenty local chefs, bakery chains, and retailers in attendance. Both media and industry representatives reacted extremely positively to the event, many expressing enthusiasm for the berry’s potential as a health food and as a versatile ingredient that can be used to differentiate one’s product offerings. No sooner had the Beijing event wrapped up, U.S. Cranberries was on its way to Shanghai where it made a big splash as a first-year exhibitor at the 2013 Food and Hotel China (FHC) show in Shanghai from November 13-15. In its 17th year, the FHC is among the premier food trade shows in China drawing an estimated 30,000 visitors from across China and around the world. The CMC’s U.S. Cranberries large corner booth just inside the entrance to the show, drew attendees visiting the USA pavilion toward the colorful displays, samples of cranberry products, and the opportunity to have their picture taken with a life-size cut-out of “Ms. Cranberry.” Although many visitors to the booth were aware of cranberries, most were unfamiliar with the various product forms and possible applications. Visitors who had never tried cranberries puckered their lips and squinted at the berry’s unique tart flavor before helping themselves to a second taste. The overall reaction to the U.S. Cranberries’ booth and number of trade leads generated were far better than expected and indicates a very promising future for U.S. cranberries in China. On Friday, November 15, Mr. Soares and Dr. Howell served as judges for a cranberry cooking competition held in cooperation with the popular culinary and lifestyle magazine, Betty’s Kitchen, and leading imported food distributor, Sinodis. The sixteen participants, who were selected from the 80 finalists among 1,000 contest applications, were all food bloggers who had learned about the competition via a Betty’s Kitchen online cranberry recipe contest. Divided into teams of four, they competed to see which team could make the best scone, muffin, and mousse using U.S. cranberries. After two hours of culinary action, Mr. Soares and Dr. Howell evaluated the result of each team’s efforts based on appearance, flavor, texture, and technique. While all participants received a cranberry gift bag, each member of the winning team also received a large bottle of cranberry juice. In post-event interviews, participants said that they love cooking with cranberries for their unique flavor and color, and that learning about the health benefits encourages them to use cranberries more at home with their families. Participants also expressed interest in using additional forms of cranberries in their recipes such as frozen, fresh, and cranberry powder. In addition to the seminar, trade show presence, demonstrations, and baking competition, innumerable meetings and discussions, including visits with FAS Under Secretary Michael Scuse and National Association of State Departments of Agriculture Vermont Agriculture Secretary Chuck Ross, took place during the 5 day trip. All combined, these experiences served to reinforce the potential that the China market holds for US cranberries!